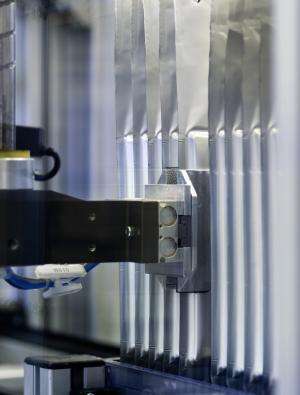 Siemens is using automation technology to support the development of efficient production processes for large-scale batteries. A research production plant is currently being built at the Center for Solar Energy and Hydrogen Research Baden-Württemberg (ZSW), Germany. As of 2015, industrial companies working at the center will begin developing close-to-production processes and new materials for lithium-ion batteries. Their objective is to increase the quality of the batteries and lower the costs. Siemens is equipping the plant with a SCADA (Supervisory Control and Data Acquisition) system to handle production data. The picture shows a grappler capturing sealed battery packs. Siemens is using automation technology to support the development of efficient production processes for large-scale batteries. A research production plant is currently being built at the Center for Solar Energy and Hydrogen Research Baden-Württemberg (ZSW), Germany. As of 2015, industrial companies working at the center will begin developing close-to-production processes and new materials for lithium-ion batteries. Their objective is to increase the quality of the batteries and lower the costs. Siemens is equipping the plant with a SCADA (Supervisory Control and Data Acquisition) system to handle production data. Among other benefits, this will help to evaluate production tests quickly. Lithium-ion batteries are a key technology for the storage of electricity from renewable sources and for the expansion of electromobility. Today, there are only modest production capacities for these batteries in Europe. In general terms, the production of lithium-ion cells comprises three steps: the production of the electrodes, then the fitting of the casing, followed by the activation, testing, and packaging of the finished cell. Making the electrodes is a complex process all by itself: carbon powder is mixed into a paste for the anode, and the cathode material is made of lithium and metal oxides. The pastes are applied to a metal film, either continuously or in patterns. The coating is only a few tenths of a millimeter thick, and it must be accurate to within one to two thousandths of a millimeter. These films move through the system at up to 50 meters per minute. The finished electrode films are cut, rolled up, and fitted in the casing. After that, the cells are filled with electrolyte and sealed. Siemens has considerable experience in drive-system and automation technologies for high-precision production processes. Researchers at the global Siemens R&D department Corporate Technology and experts of the Industry Sector have analyzed all the processes used in battery production and put together a portfolio of solutions. It covers everything from drive systems and controls for individual production machines to communications technology and the plant management center. It also includes SCADA systems that supply all production data in real time. This is particularly useful for a research production line, because the results - such as quality data for various production or material variants - are available right away. Siemens will use its production-planning software Tecnomatix to generate a virtual model of the plant and thus optimize its efficiency even before it is built. Energy-storage devices are an important next-generation technology for Germany - both for the automotive industry and for the continued expansion of renewable energies. The new plant is directed at precisely these markets. It is expected to produce 300 industrial-standard prismatic lithium cells per day, each with a capacity of more than 20 ampere-hours. Siemens and the ZSW have signed a partnership agreement for the construction of the research production plant.